In 2018 The Smyrna Surfari Club is celebrating its 39th year of existence. It is the second oldest, continuously active private surf club in the world and probably the first to have a scholarship program. It was founded in 1979 by thirteen local surfers, most of whom are still active in the Club. Current membership is about 80 active members. 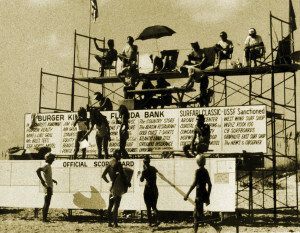 The first surfing club in New Smyrna was founded in 1963; the Smyrna Surf Club. 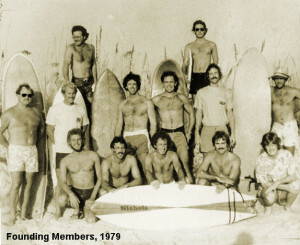 The Coronado Surf Club was the next group to organize, however, these early groups faded away as many members left the area in search of careers and/or college degrees. The new group wanted to be more than a social club. They decided that the Surfari Club would establish its identity as one of public service. And so, the Surfari Scholarship was born. A lot of those founding members could recall their teenage years, when just being a surfer still had an image problem. As real surfers, they resented the Hollywood image that the “Beach Blanket” movies of the time projected. One of the most tired clichés was that surfers were not good students. Not true. Of the thirteen original members of the Club, all but two earned a college degree. (And those two went on to great success). So the Surfari Club decided that their mission would be to raise money and give it to a surfer to go to college or vocational school. The best football player in his high school always gets a chance to go to college, and so does the best basketball player. The Surfaris thought that the best surfer deserved to go, too. The Club organized a surf contest, sold raffle tickets and the proceeds went to fund the first Smyrna Surfari Club High School Scholarship for $500. It was awarded to Brian Millard in 1980. Brian went on to found his own CPA firm in Winter Park. Since 1979, the Club has hosted over 100 surf contests, awarded over $200,000 in scholarship monies and similar stories of the success of the Surfari Club Scholarship recipients over the ensuing 39 years are too numerous to cover here. Although the club’s emphasis is still focused on surfing and scholarship, we now take part in a variety of area events and endeavors. Please visit our What We Do page to learn more. Our annual Seaside Fiesta Surf Contest is coming June 23, 2018. Please go to the Seaside Fiesta Surf Contest page to learn more.